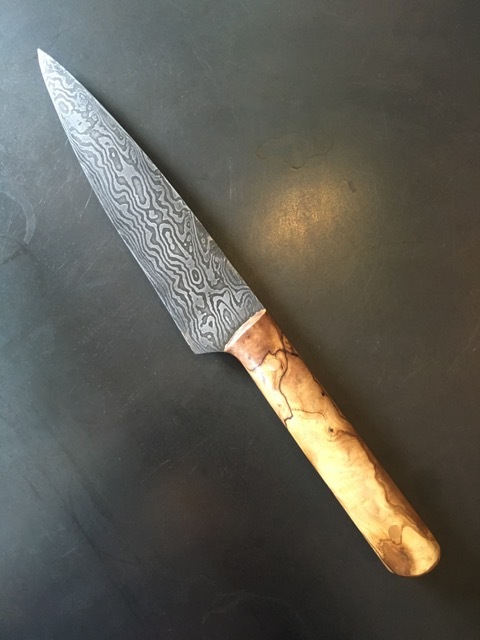 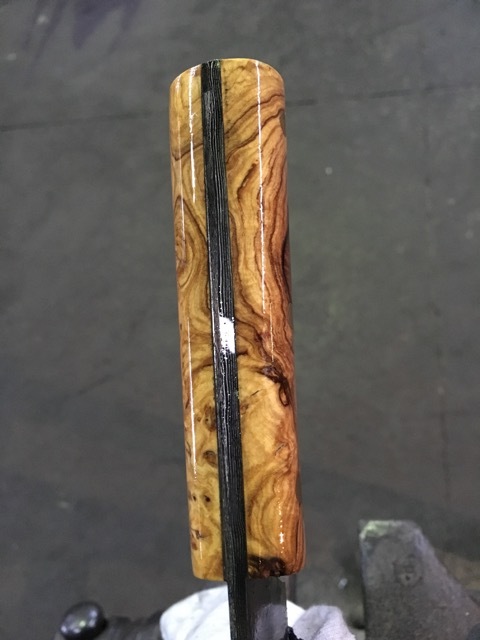 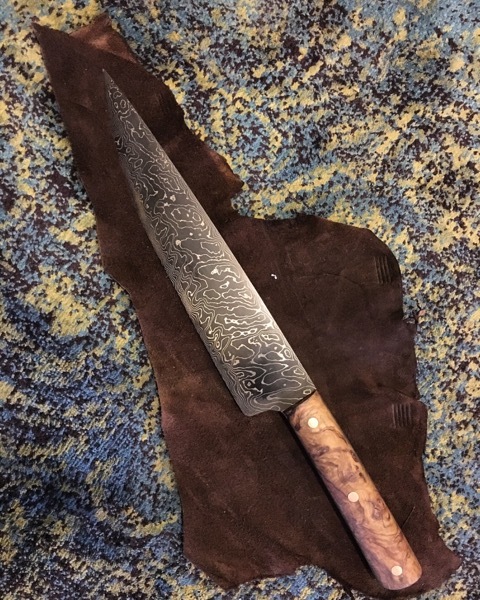 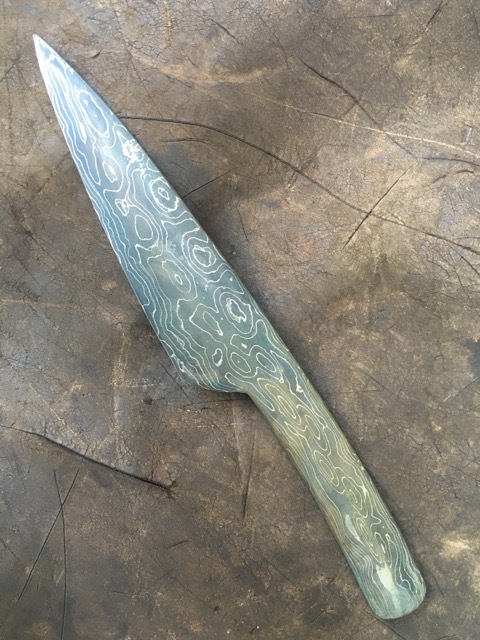 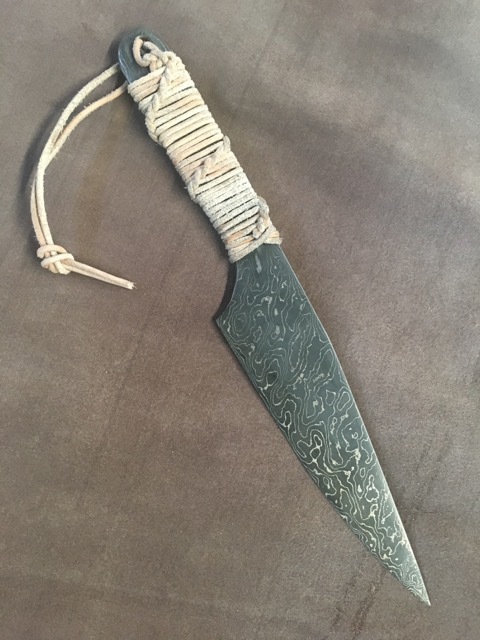 ‘I make my knives using an instinctive sense of beauty that is integral to their function, with the instinct that says, “if this is beautiful it will work well”. 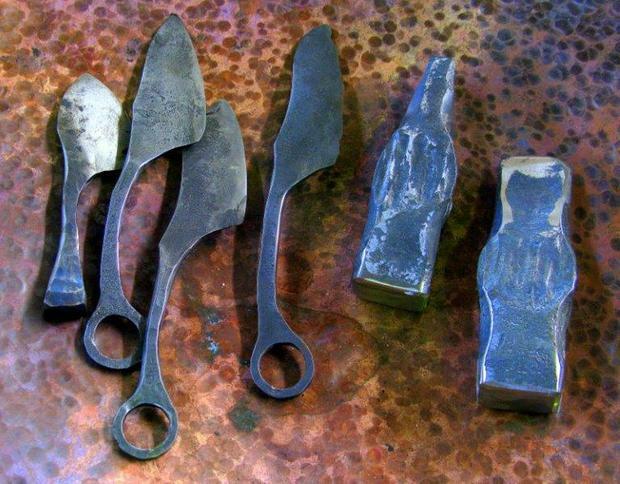 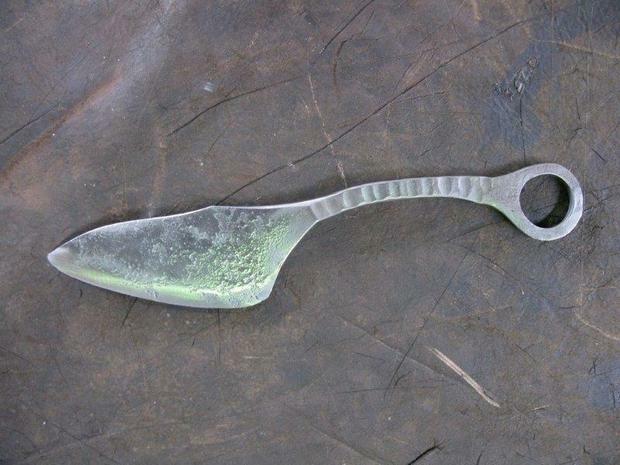 I forge all the pieces by hand and like to show the working and hammer marks in the piece. 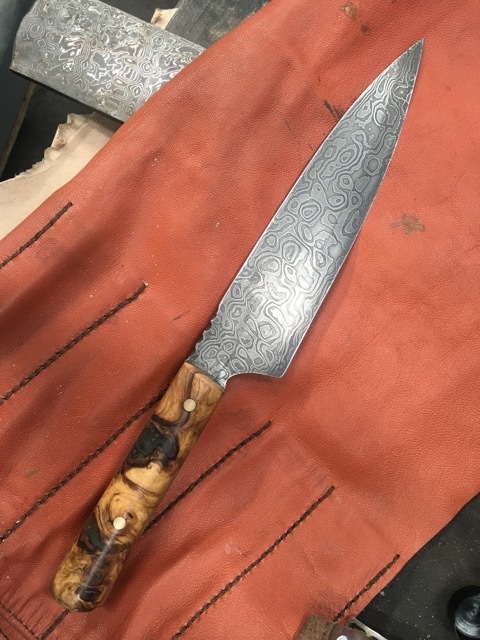 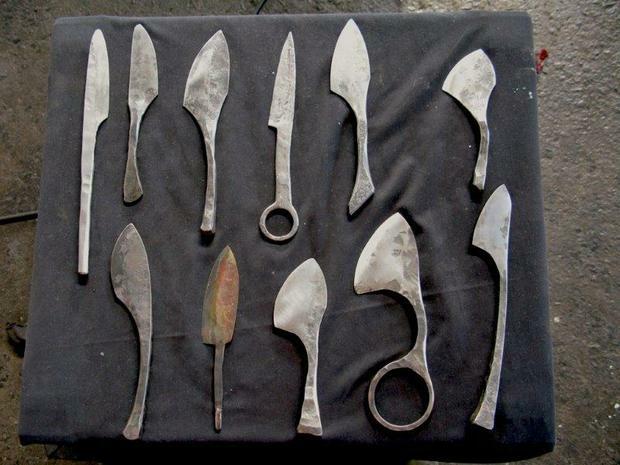 As a result all the knives are unique and are signed and numbered in the sequence that they are made. 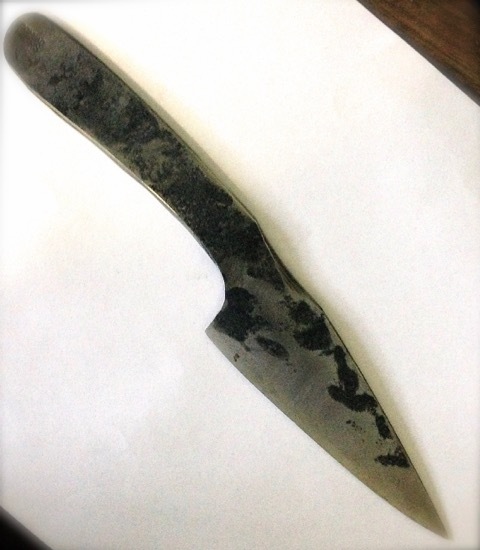 I use charcoal to heat the steel, that I make on my farm using Rooikrans wood that is left over from alien clearing. 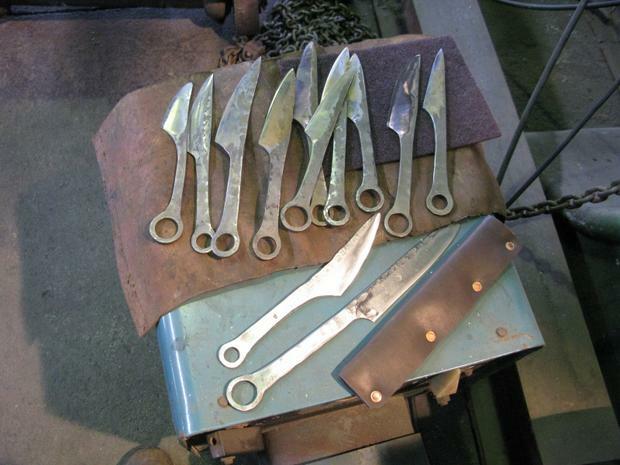 The steels I use vary from old Anti –aircraft gun spring to train bearing, saw blade Damascus and stainless steel. 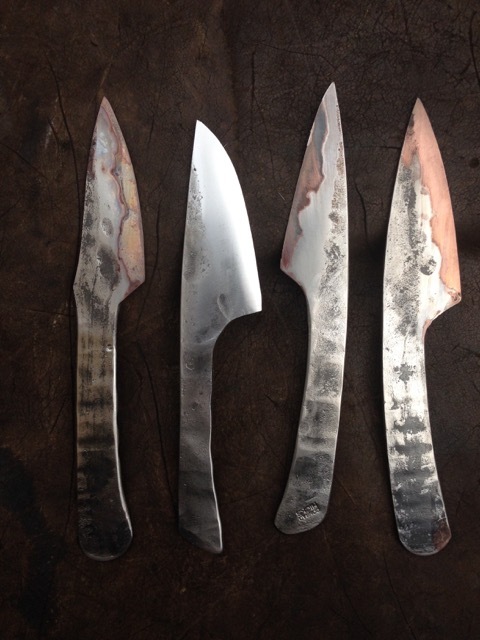 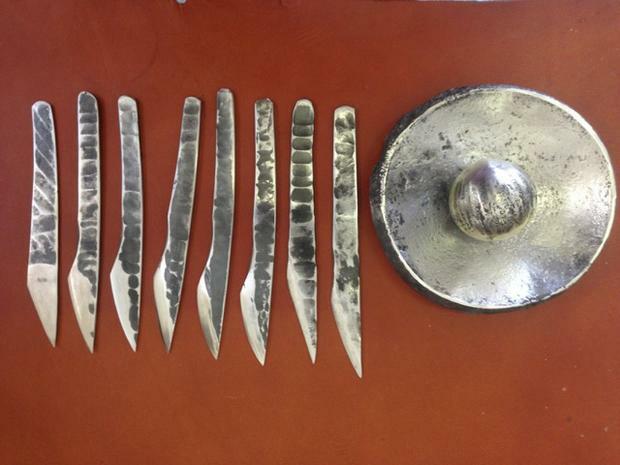 They are hardened to and sharpened to razor finish. 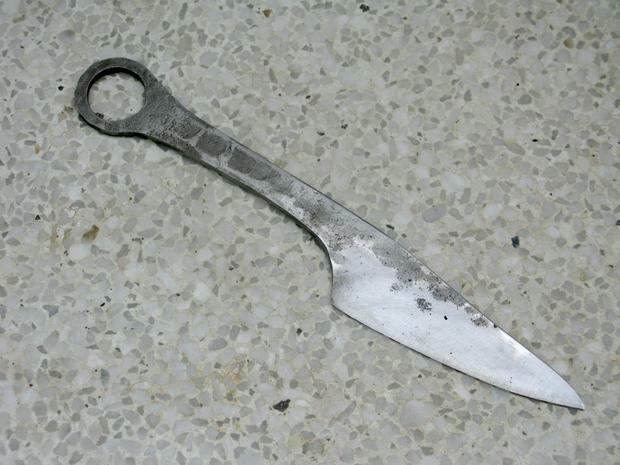 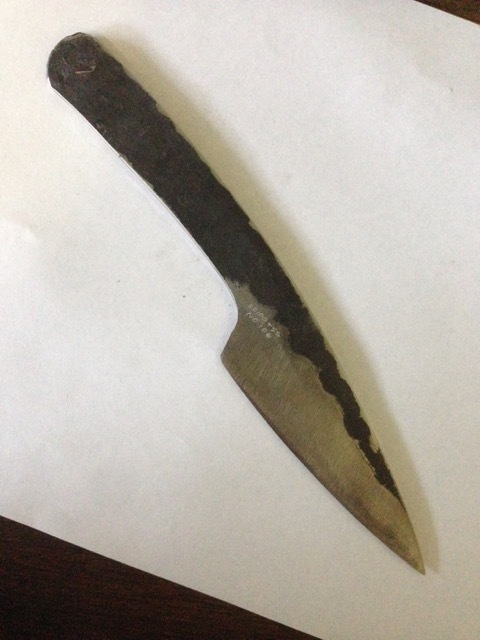 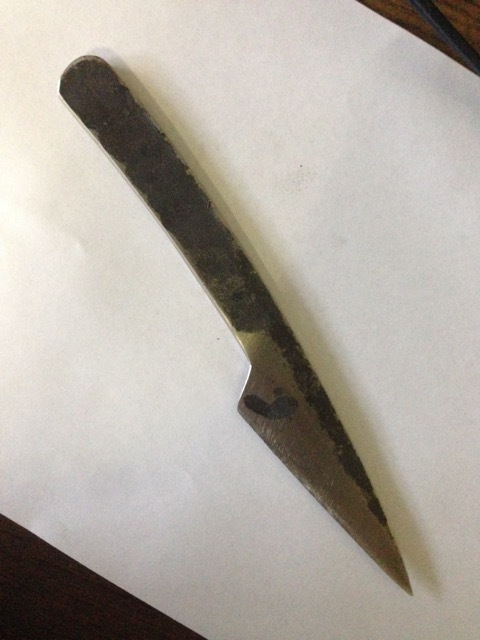 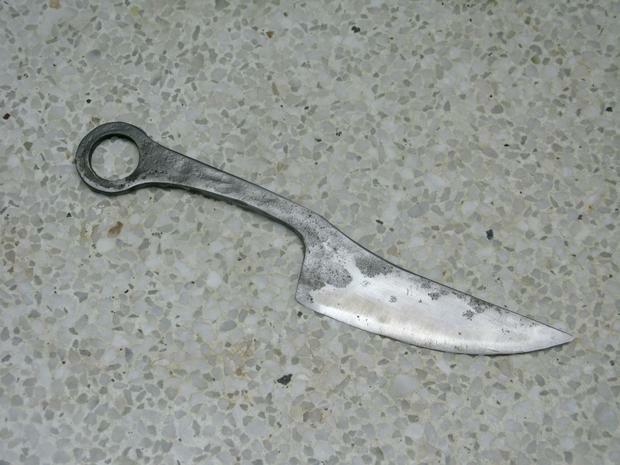 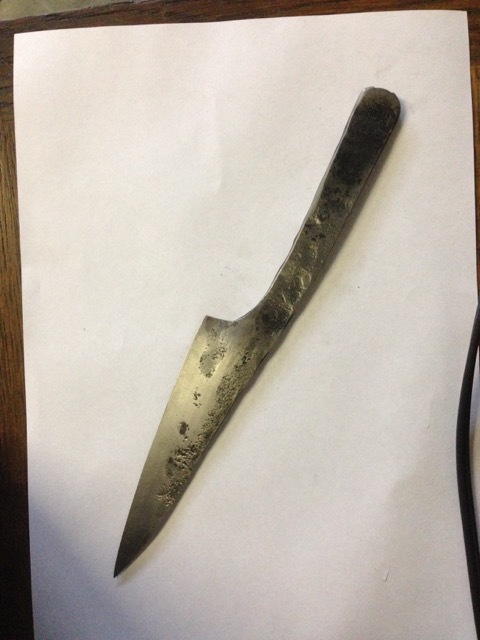 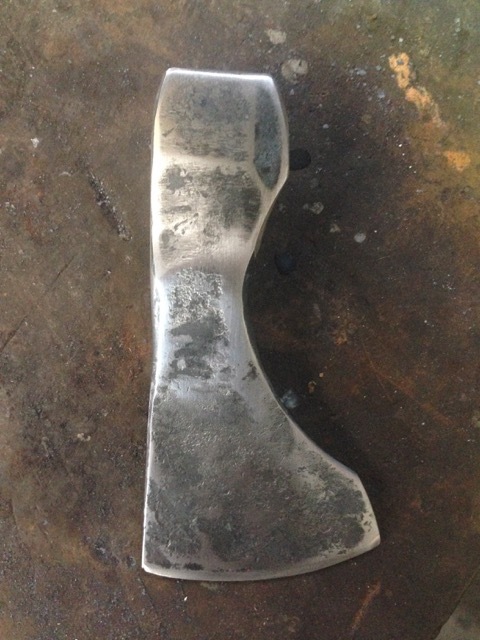 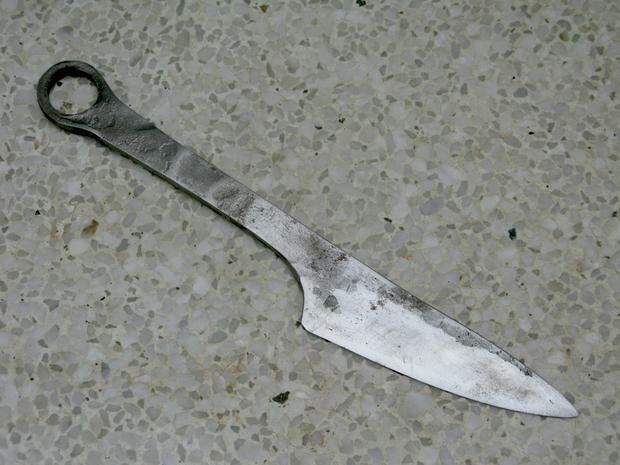 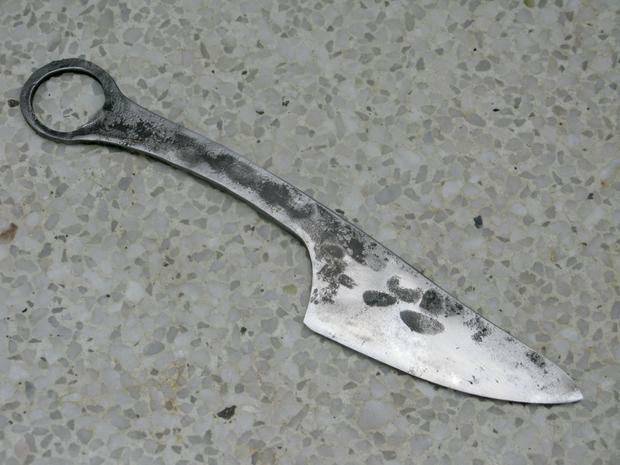 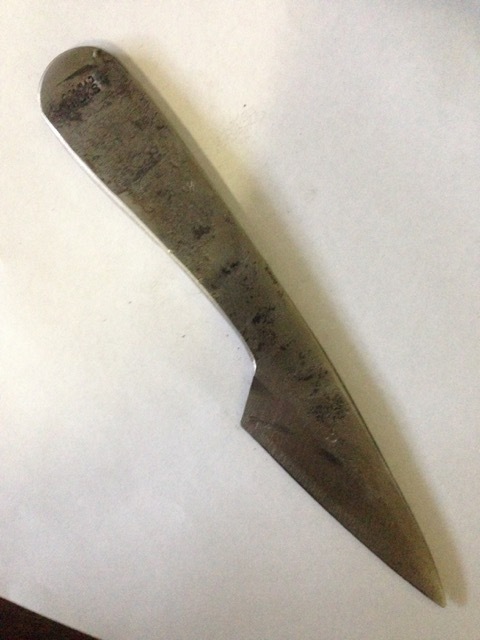 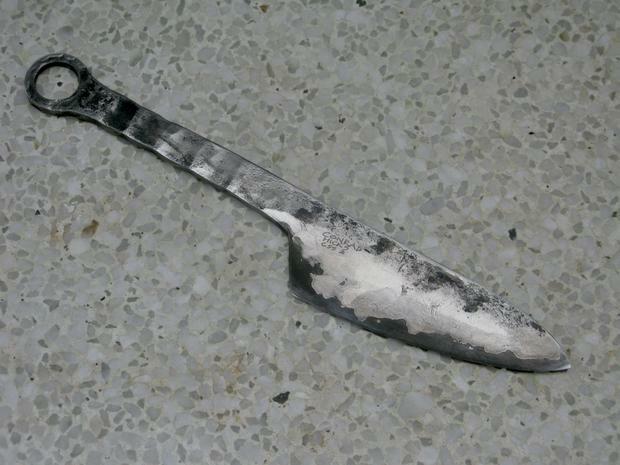 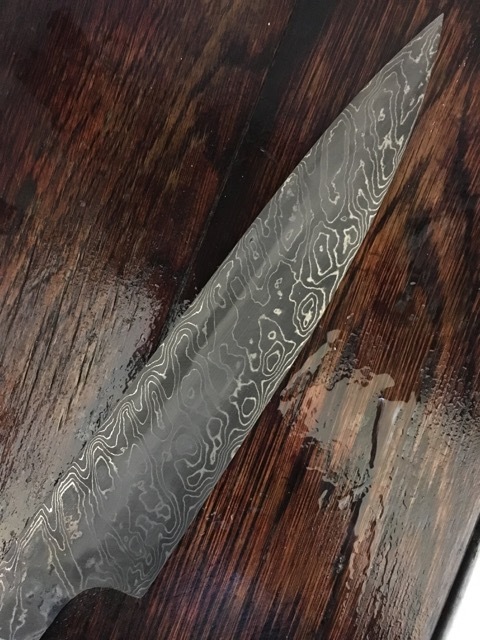 Only High carbon steel can be hardened to this level. 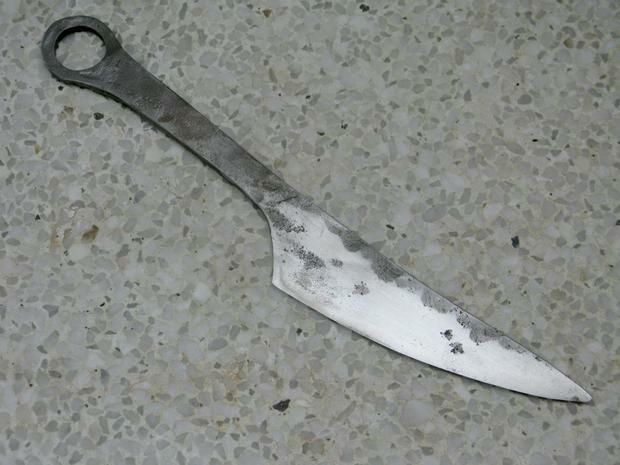 Because the high carbon steels are not stainless they will tarnish if left in the dishwasher or unwashed. 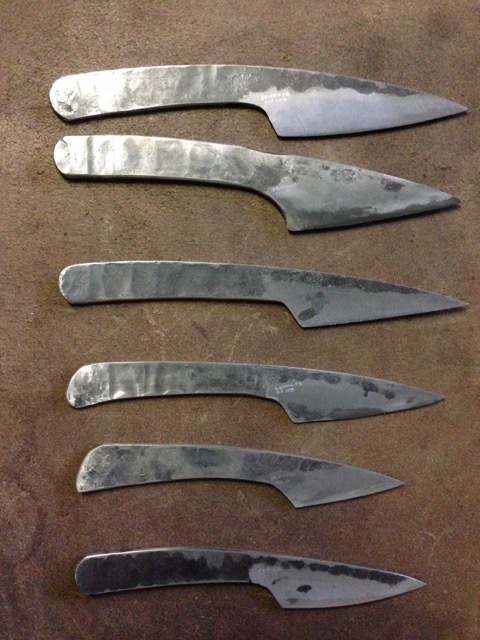 The carbon blades should be dried before storing in their pouches. 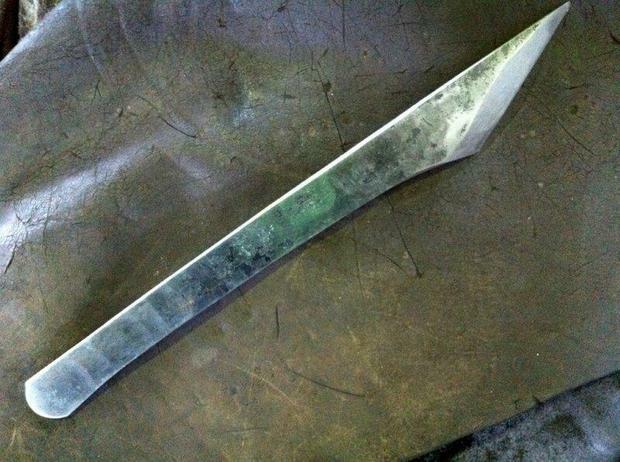 Avoid dropping on hard surfaces as the tips could break. 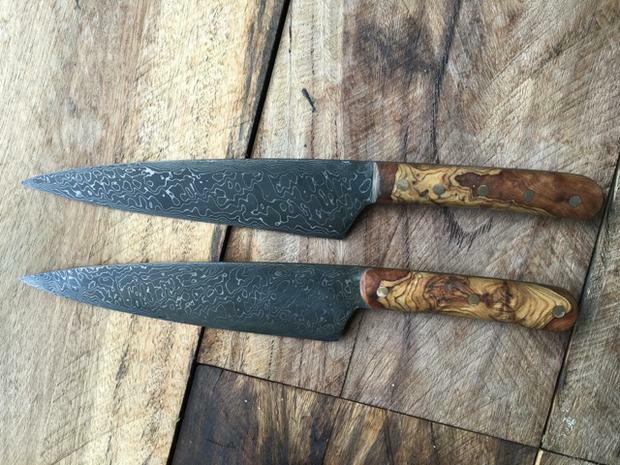 These knives are intended for kitchen use. 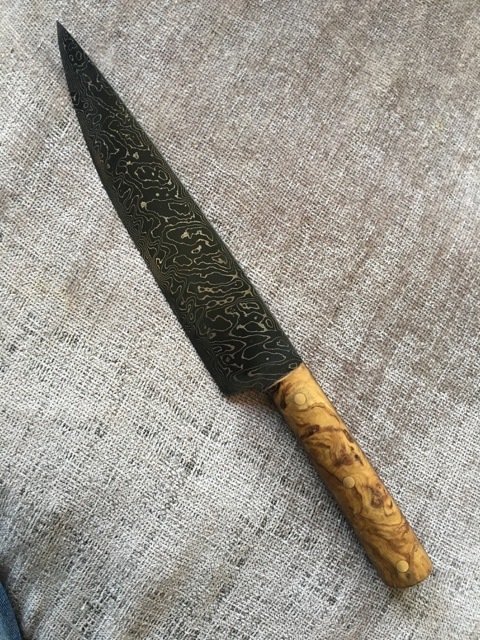 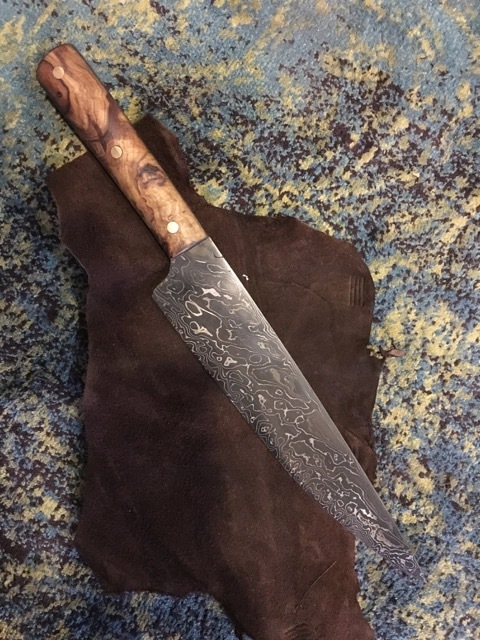 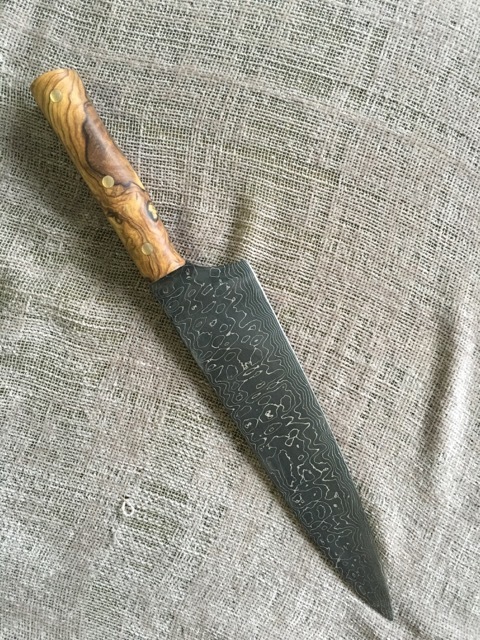 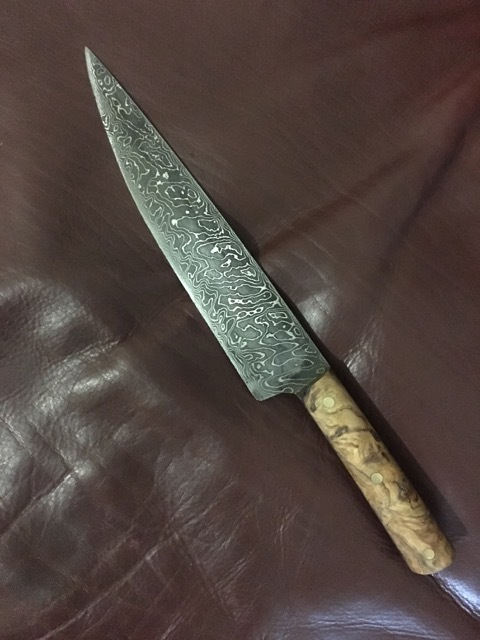 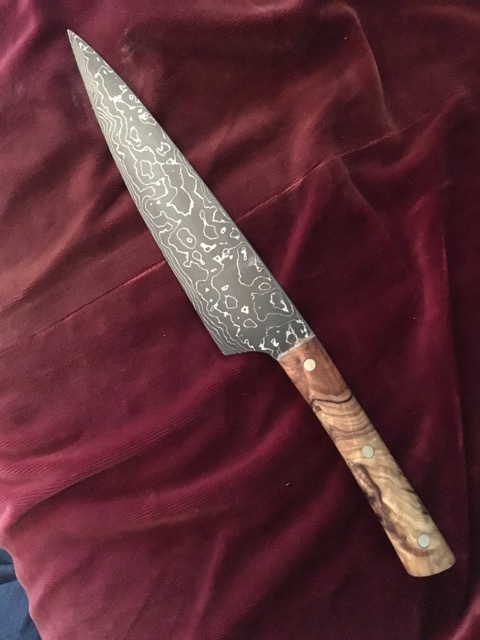 I have introduced the stainless steel and high carbon steel and the stainless and Damascus combination blades in order to make the blades more kitchen friendly for those not in the habit of looking after the more high maintenance all steel knives. 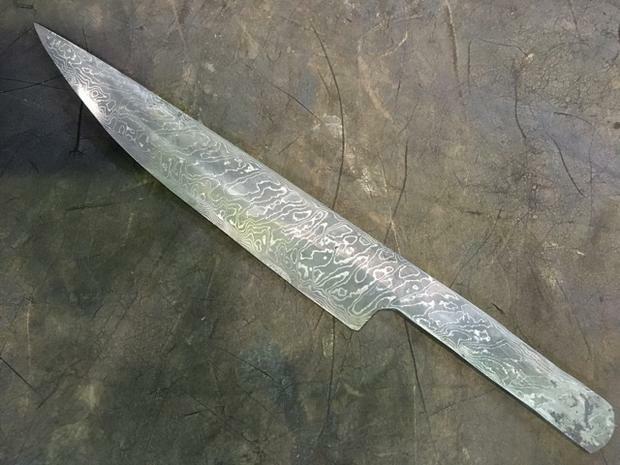 The hard cutting edge is encased in stainless steel which not only makes the contrast very beautiful but it gives a very hard edge and at the same time a flexible but stain resistant blade. 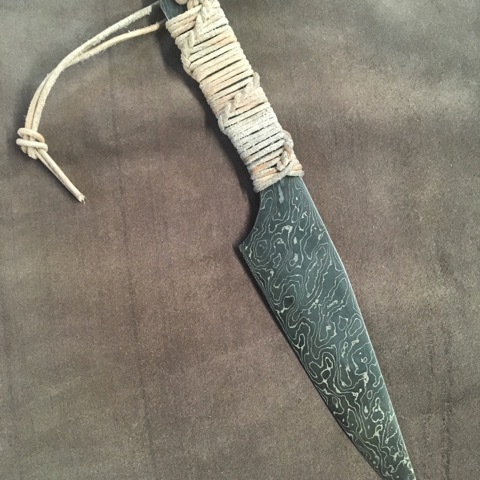 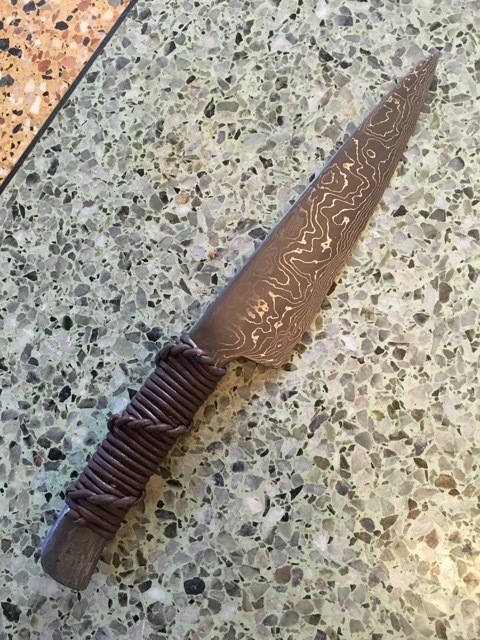 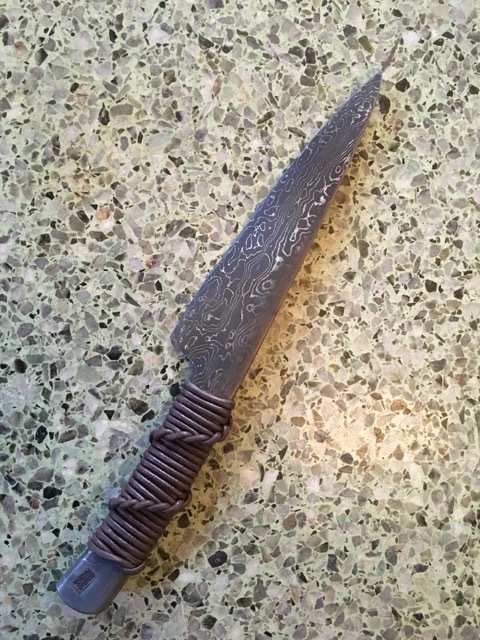 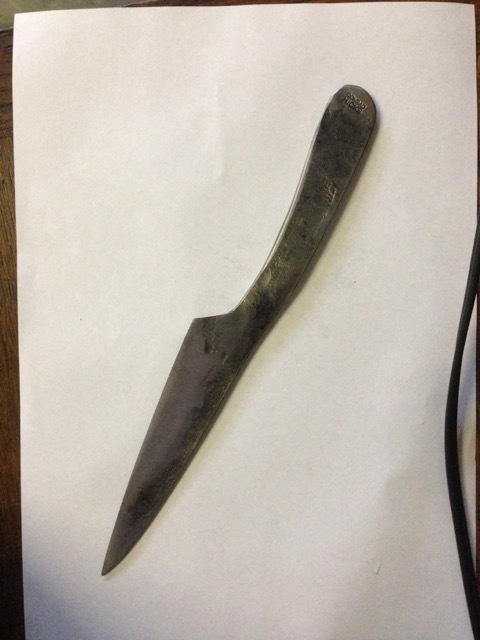 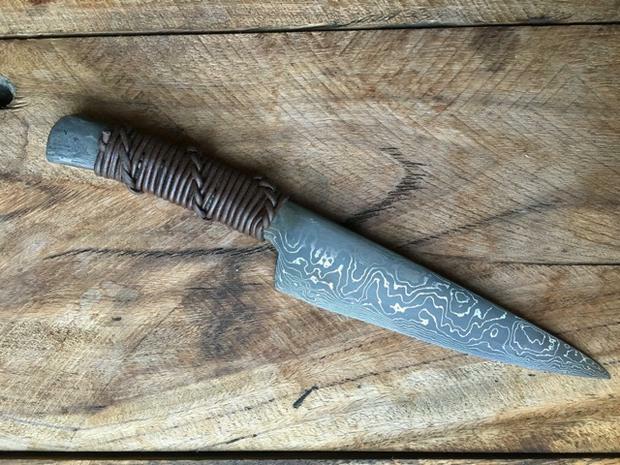 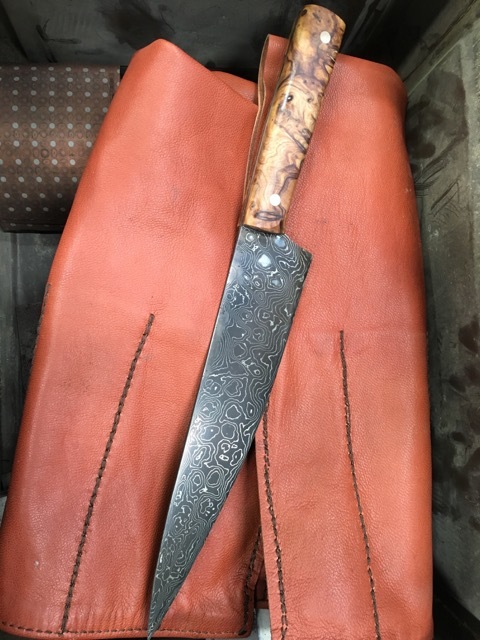 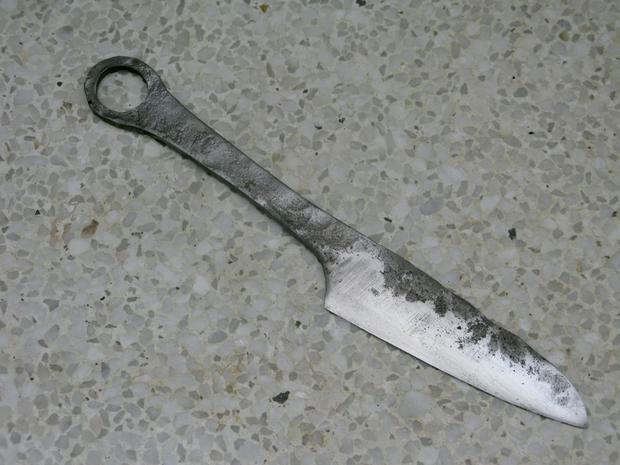 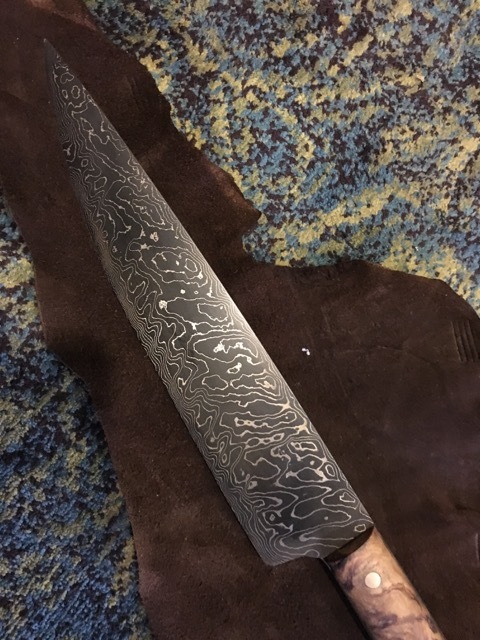 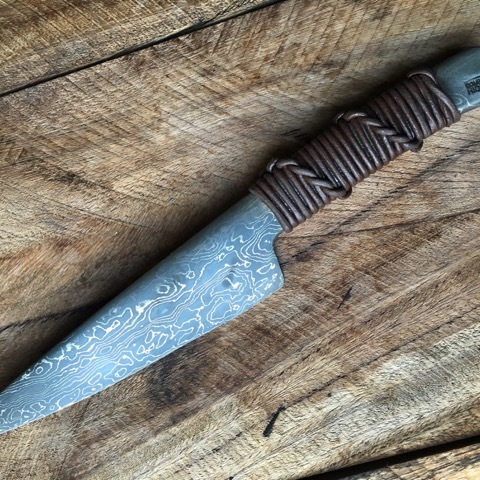 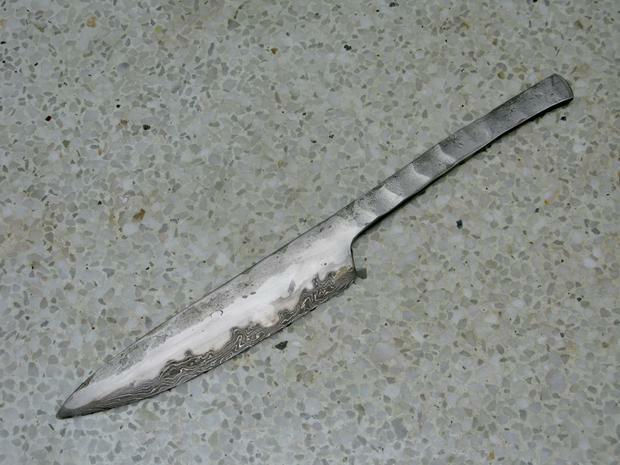 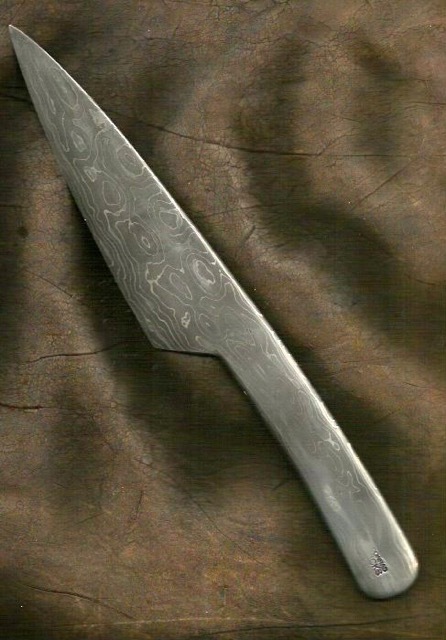 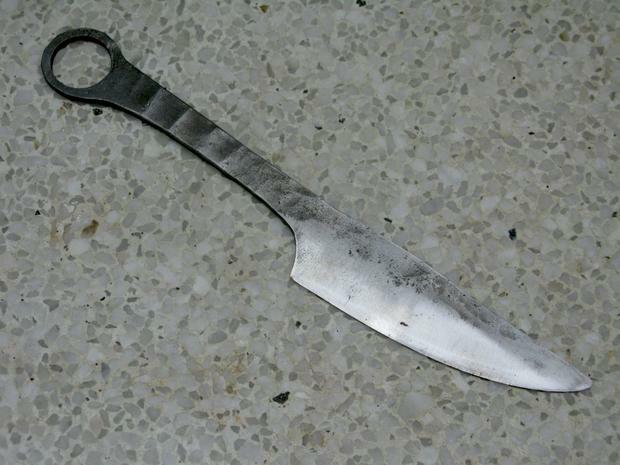 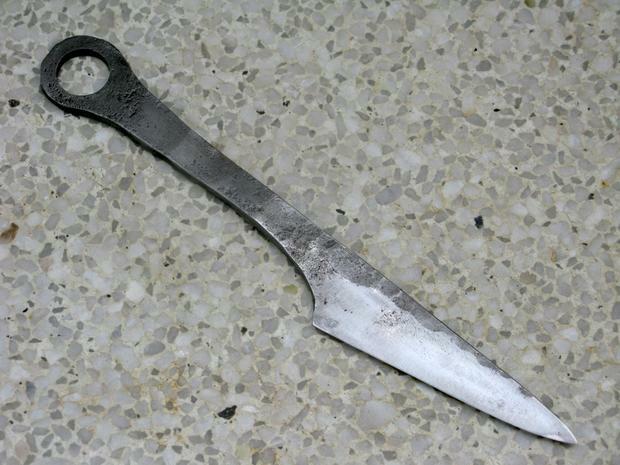 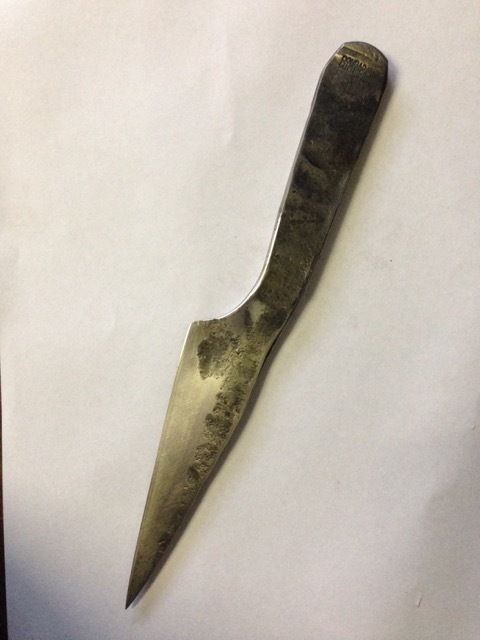 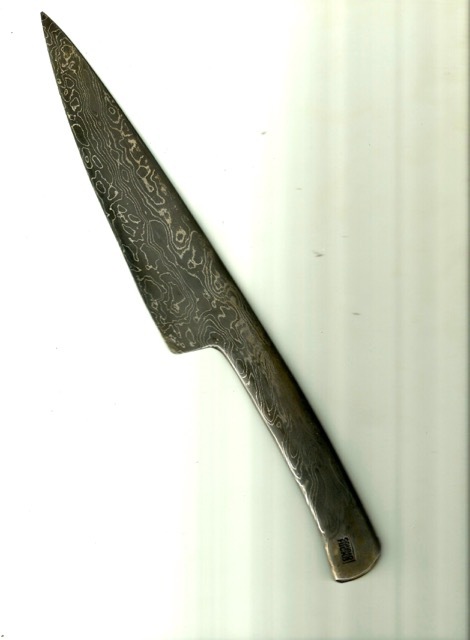 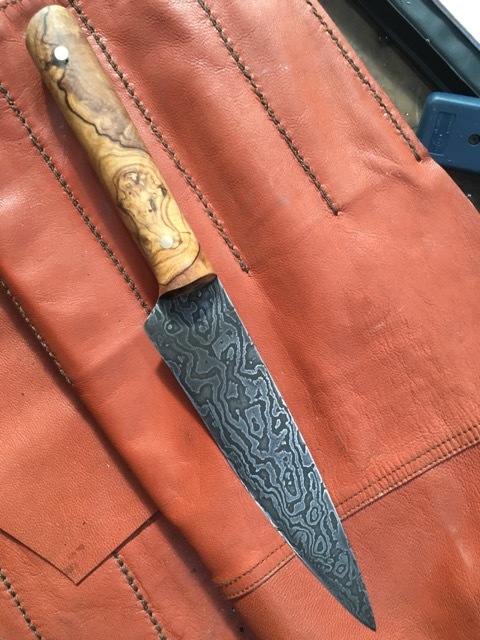 The Damascus steel is created by welding layers of old saw blades under very high heat in the charcoal fire. 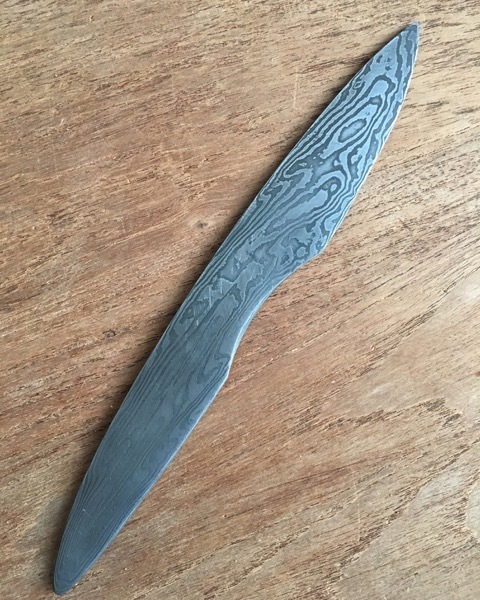 The layers are exposed as the blade edge is ground, revealing clearly the contrasting patterns or grain’.